Landscapes such as those seen in Yellowstone have long been shaped by fire and not just the cool, creeping ground fires often described as "good" for grass production. The natural history of fire in the park includes large-scale conflagrations sweeping across the park's vast volcanic plateaus, hot, wind-driven fires torching up the trunks to the crowns of the pine, and fir trees at several hundred-year intervals. Such wildfires occurred across much of the ecosystem in the 1700s. But that was prior to the arrival of European explorers, the designation of the park, and the pattern established by its early caretakers to battle all blazes, believing that fire suppression was good stewardship. Throughout much of the 20th century, park managers and visitors alike have continued to view fire as a destructive force, one to be mastered, or at least tempered. By the 1940s, ecologists recognized that fire was a primary agent of change in many ecosystems, including the arid mountainous western United States. In the 1950s and 1960s, national parks and forests began to experiment with controlled burns, and by the 1970s Yellowstone and other parks had instituted a natural fire management plan to allow the process of lightning-caused fire to continue influencing wildland succession. Many of Yellowstone's plant species are fire-adapted. Some (not all) of the lodgepole pines (Pinus contorta), which make up nearly 80 percent of the park's extensive forests, have cones that are serotinous sealed by resin until the intense heat of fire cracks the bonds and releases the seeds inside. Fires may stimulate regeneration of sagebrush, aspen, and willows, but the interactions between these plants and fire is complicated by other influences such as grazing levels and climate. Though above-ground parts of grasses and forbs are consumed by flames, the below-ground root systems typically remain unharmed, and for a few years after fire these plants commonly increase in productivity. In the first 16 years of Yellowstone's natural fire policy (1972 to 1987), 235 fires were allowed to burn 33,759 acres. Only 15 of those fires were larger than 100 acres, and all of the fires were extinguished naturally. Public response to the fires was good, and the program was considered a success. The summers of 1982 to 1987 were wetter than average, which may have contributed to the relatively low fire activity in those years. No one anticipated that 1988 would be radically different. In April and May, Yellowstone received higher-than normal rainfall. But by June, the greater Yellowstone area was experiencing a severe drought. Forest fuels grew progressively drier, and the early summer thunderstorms produced lightning without rain. The fire season began, but still without hint of the record season to come. Eleven of 20 early-season fires went out by themselves, and the rest were being monitored in accordance with the existing fire management plan. The summer of 1988 turned out to be the driest in the park's recorded history. On July 15, only 8,500 acres had burned in the entire greater Yellowstone area, but within a week, fires within the park alone encompassed more nearly 99,000 acres, and by the end of the month, dry fuels and high winds combined to make the larger fires nearly uncontrollable. National news reporters poured into Yellowstone National Park, as did firefighters from around the country, bolstered by military recruits. On the worst single day, August 20, 1988, tremendous winds pushed fire across more than 150,000 acres. Throughout August and early September, some park roads and facilities were closed to the public, and residents of nearby towns outside the park feared for their property and their lives. Yellowstone's fire management policy was the topic of heated debate, from the restaurants of park border towns to the halls of Congress. By September 11, 1988, the first snows of autumn had dampened the fires where the nation's largest fire-fighting effort could not. The imminent danger to life and property was over, and firefighters were gradually sent home, although the last of the smoldering flames were not extinguished until November. Staff in Yellowstone National Park went to work surveying the impacts of the fires on wildlife, plants, historic structures, trails, and more and answering the demands for information, explanation, and a new fire management policy. A total of 248 fires started in greater Yellowstone in 1988; 50 of those were in Yellowstone National Park. Despite widespread misconceptions that all fires were initially allowed to burn, only 31 of the total were; 28 of these began inside the park. In the end, 7 major fires were responsible for more than 95 percent of the burned acreage. Five of those fires were ignited outside the park, and 3 of them were human-caused fires that firefighters attempted to control from the beginning. More than 25,000 firefighters -- as many as 9,000 at one time -- attacked Yellowstone fires in 1988 at a total cost of about $120 million. Thankfully, the fires killed no park visitors and no nearby residents. Outside the park, two firefighters were killed -- one by a falling tree and one while piloting a plane transporting other personnel. Ecosystemwide, about 1.2 million acres were scorched; 793,000 (about 36 percent) of the park's 2,221,800 acres were burned. Sixty-seven structures were destroyed, including 18 cabins used by employees and guests and one backcountry patrol cabin in Yellowstone. Estimated property damage totaled more than $3 million. About 665 miles of hand-cut fireline and 137 miles of bulldozer lines, including 32 miles in the park, needed some rehabilitation, along with the remnants of fire camps and helicopter-landing spots. Surveys found that 345 elk (of an estimated 40,000 to 50,000), 36 deer, 12 moose, six black bears, and nine bison died in greater Yellowstone as a direct result of the fires; two radio-collared grizzly bears were missing and were presumed to have been killed, (although one turned up alive and well several years later). Most of the animals that died were trapped as fire quickly swept down two drainages, and were discovered when biologists subsequently observed scavenging grizzlies, coyotes, and birds feeding on the carcasses. A few small fish-kills occurred as a result of either heated water or dropping fire retardant on the streams. Surveys revealed that less than one percent of soils were heated enough to burn below-ground plant seeds and roots. A massive effort was funded by the U.S. Congress to restore damaged facilities and to study the long-term ecological, social, and economic effects of the Yellowstone fires. Although the tourist season was cut prematurely short by the fires and associated firefighting activity, the feared abandonment of regional visitors failed to materialize in 1989. The effects on many plants and animals are still being studied, although in the short-term, most wildlife populations showed no effect or rebounded quickly from the fiery summer. In the several years following 1988, ample precipitation combined with the short-term effects of ash and nutrient influx to make for spectacular displays of wildflowers in burned areas. And, where serotinous lodgepole pines were burned, seed densities ranged from 50,000 to 1 million per acre, beginning a new cycle of forest growth under the blackened canopy above. Across the nation, national parks and forests suspended and updated their fire management plans, assisted by the ecological assessment of a panel of independent scientists and by revised national fire management policies. In 1992, Yellowstone National Park again had a wildland fire management plan, but with stricter guidelines under which naturally occurring fires may be allowed to burn. Although unprecedented in the 125-year history of the park, the scientists reviewing the effects of the 1988 fires reminded us that fires of such scale burned elsewhere in similar ecosystems during this century, and earlier in the landscape's history. Only a miniscule portion of once vast wilderness landscapes has been preserved, and the boundaries and spatial extent of these preserved bear little relationship to the natural processes necessary for their preservation. The 1988 fires have laid bare the broad extent of our ignorance of those natural processes. -- N. A. Christensen, et al. 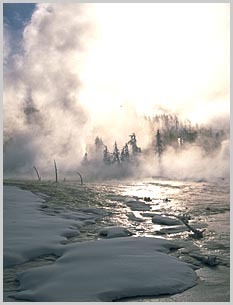 Through continued public education, scientific research, and professional fire management, Yellowstone hopes to preserve the process of natural fire in the park while minimizing adverse effects on park visitors and neighbors, recognizing the inevitability of this force to continue shaping the landscape as it has for centuries.